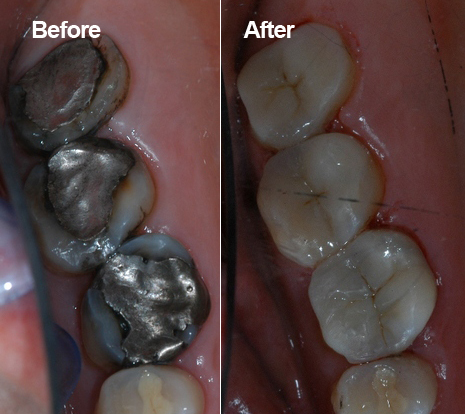 Amalgam Filling Replacement – this patient was unhappy with the colour of their dark silver fillings. They were replaced with a combination of porcelain and tooth coloured restorations. 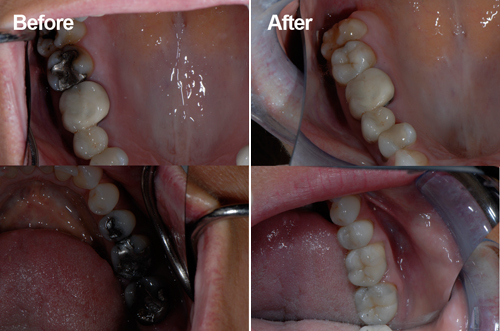 Amalgam Filling Replacement – this patient had small silver fillings replaced with tooth coloured fillings. Amalgam Filling Replacement – this patient had some very old silver fillings that she wanted to replace before they broke down further. They were replaced with a combination of porcelain restorations and tooth coloured fillings. Amalgam Filling Replacement – this patient from Perth was having discomfort because of her old silver amalgam fillings. They were no longer fitting the tooth well and decay had developed underneath. The patient had them replaced with porcelain restorations.